Unwanted fat below your chin, behind your bra straps, or around your knees may be resistant to diet and exercise. In particular, fullness in the submental area, which creates a double chin, can make you look older or heavier even if you are relatively young and fit. KYBELLA® offers an answer. An injectable, non-surgical treatment, KYBELLA can reduce fat in the submental area and other sites to give you more defined and youthful features. Treatments are non-invasive, effective, and approved by the FDA. Dr. Vu offers a range of fat reduction treatments through his Huntington Beach practice. KYBELLA can be a great option for patients who want to eliminate small areas of fat like a double chin. As a board-certified plastic surgeon with more than twenty years of experience, Dr. Vu can also guide patients to alternative treatments, including VANQUISH ME™ and liposuction, if they require more significant fat reduction. Purpose. 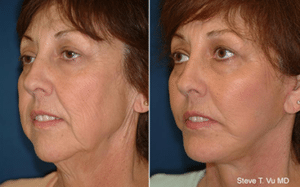 A double chin can result from weight gain, genetics, or aging. It is one of those facial features that, while not immediately noticeable, tend to affect aesthetics in a subtle and significant way. The same is true of fat around the bra straps and knees. Dr. Vu provides KYBELLA as an injectable solution to Huntington Beach patients that want to eliminate these cosmetic issues with no incisions and no downtime. How it works. KYBELLA’s active ingredient, synthetic deoxycholic acid, helps to break down fat cells so that the body can absorb them naturally. When Dr. Vu injects KYBELLA, this process reduces fullness in the treated area. Unless you gain weight, you can expect the improvement you see to be permanent. Timeline. Typically, Dr. Vu recommends that his Huntington Beach patients have 2-4 treatments with KYBELLA spaced one month apart, though the number of sessions that you have will depend on the amount of fat you want to eliminate. By the end of the process, you can expect a noticeable difference in the areas you have had treated. After KYBELLA. Following each appointment, you can get right back to work and other normal daily activities. There is no recovery time. You will likely notice swelling in the treated area as the solution breaks down fat cells for your body to absorb. Receiving treatments spaced one month apart helps Dr. Vu assess your needs and target the fat left over in the area. A popular treatment option in Dr. Vu’s practice, VANQUISH ME is a well-established, non-surgical technology for fat reduction. To know if you should consider VANQUISH ME instead of KYBELLA, it helps to understand how VANQUISH ME works. VANQUISH ME uses radiofrequency (RF) waves to melt away fat through a process called apoptosis. The device can treat a broad area in a single appointment with our practice, and it will only affect only the fat cells about one centimeter below the skin. The advantages to this device are that the treatment areas can be larger, less pain since there is no skin contact, no swelling or bruising, and limited amount of skin reactions. This makes treatment with VANQUISH ME safe, comfortable, predictable, and effective. Some of the similarities between KYBELLA and VANQUISH ME follow. Anesthetic approach. Huntington Beach patients receive treatment with KYBELLA and VANQUISH ME while fully awake. Both approaches are comfortable enough that there is no need for anesthesia or numbing. Non-surgical solutions. KYBELLA and VANQUISH ME don’t require incisions or sutures. Generally, you can have treatment on the same day as your consultation. The process for both is fast and easy for patients, and there is no downtime afterward. Multiple applications. Patients will visit Dr. Vu’s practice several times for treatment to get the final results that they want. Benefits. Both KYBELLA and VANQUISH ME can be great options for patients who have conservative expectations and who have moderate-to-good skin tone. The biggest way in which KYBELLA and VANQUISH ME differ is in their areas of effect. KYBELLA is FDA-approved to reduce fat in the submental region, helping to eliminate the appearance of a double chin. Dr. Vu can also use KYBELLA to resolve small areas of unwanted fat for Huntington Beach patients, such as around the knees and bra straps. VANQUISH ME applies a much broader treatment that is ideal for the abdomen, hips, thighs, and arms. Generally, a single treatment can cover about 75% of the surface area of the abdomen, and, while the results are subtle, Huntington Beach patients can reduce 1-4 inches from their waist after several sessions. KYBELLA is not effective for this type of broad-scale fat removal. Part of the reason that Huntington Beach patients rely on Dr. Vu for their care is that he takes the time to get to know them, learn about their aesthetic concerns, and make recommendations based on their needs and goals. Often, patients will come to him with general interest in one procedure, and they will find out that they are actually better suited to a different treatment. This is frequently the case with KYBELLA and liposuction. Liposuction is a common plastic surgery to remove areas of unwanted fat. Dr. Vu combines liposuction with procedures such as body lift and tummy tuck, and he can also perform it as a stand-alone surgery. During the procedure, he makes small incisions, injects a tumescent fluid and uses a specialized medical cannula to break up and suction away fat. KYBELLA is a non-surgical solution that requires no incisions, no downtime, and no recovery period. Depending on the scope of the surgery, liposuction may require all three. Huntington Beach patients will see more noticeable improvement with liposuction than with KYBELLA since the procedure gets rid of a much larger amount of fat. KYBELLA patients will visit the practice multiple times over the course of several months to get the maximum benefit from their treatment. Liposuction will remove the targeted fat in a single surgical session. Treatments like KYBELLA, VANQUISH ME, and liposuction have advantages suited to different patient needs. Dr. Vu can guide you in exploring each and help you choose the right approach to accomplish your goals. Get slimmer, fitter features with KYBELLA and other fat reduction treatments. Schedule an appointment with Dr. Vu online or by calling our practice in Huntington Beach at (714) 848-1133.